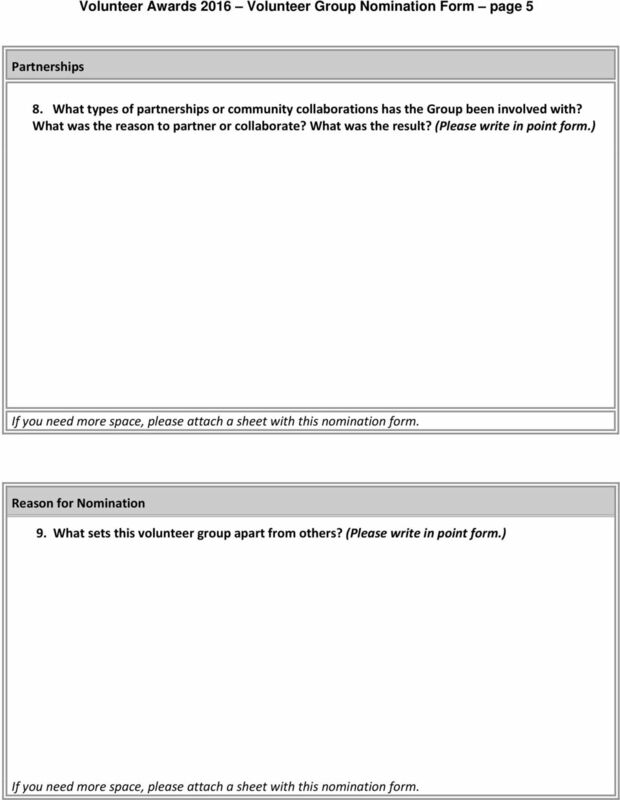 Download "Volunteer Awards 2016 GROUP Nomination Form"
3 Volunteer Group History Volunteer Awards 2016 Volunteer Group Nomination Form page 3 1. How long has the group been in operation? 2. How many volunteers are involved in the group? 3. Average number of hours in a given month volunteered by all volunteers in the group: Volunteer Group s Contribution 4. Describe the purpose of the group and who they serve. (Please write in point form.) 5. Describe the group s contributions. (Please write in point form.) Describe how they demonstrated initiative, leadership and creativity. What are their contributions? 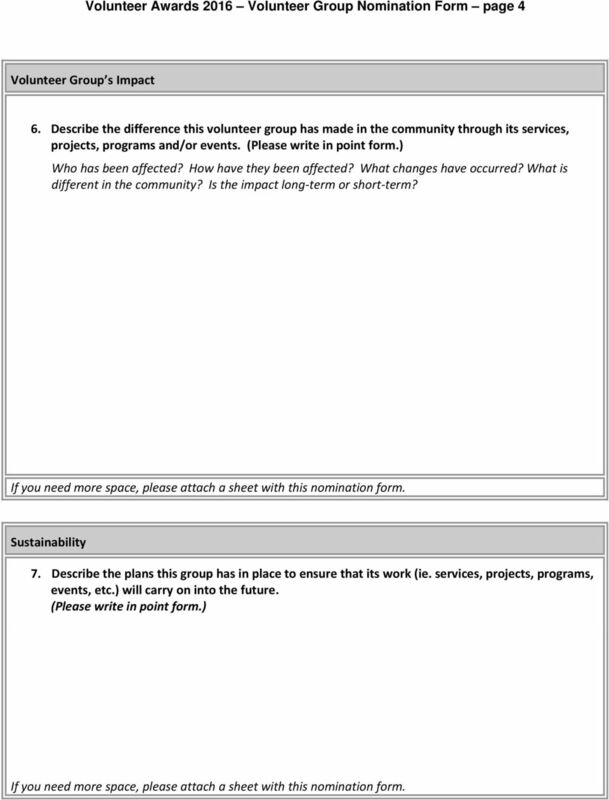 6 Volunteer Awards 2016 Volunteer Group Nomination Form page 6 Brief Summary to be read at the Ceremony (1 2 sentences only) Please provide a brief summary that highlights this volunteer group s contribution, which can be read during the ceremony to inform others of their accomplishments. 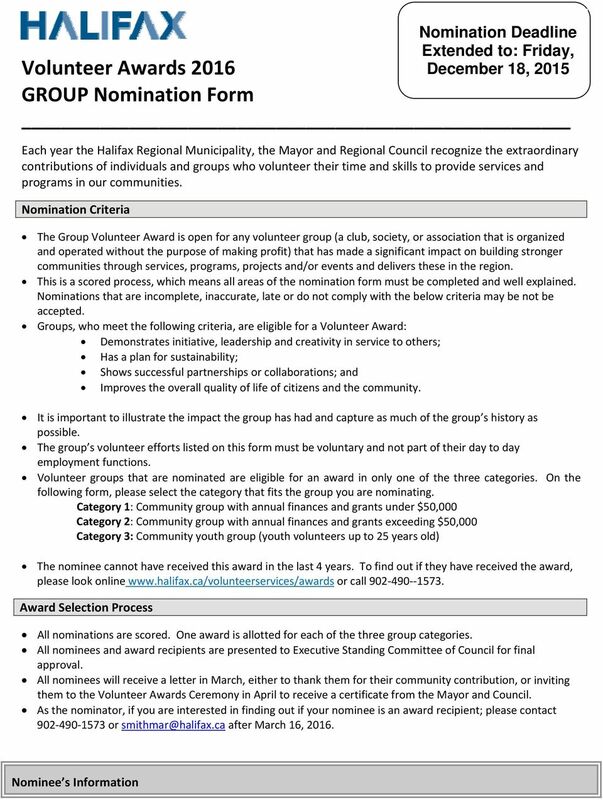 In accordance with Section 485 of the Municipal Government Act (MGA), the personal information collected on this form will only be used for purposes relating to the HRM Volunteer Award s nomination, selection and announcement process or as otherwise consented to herein. 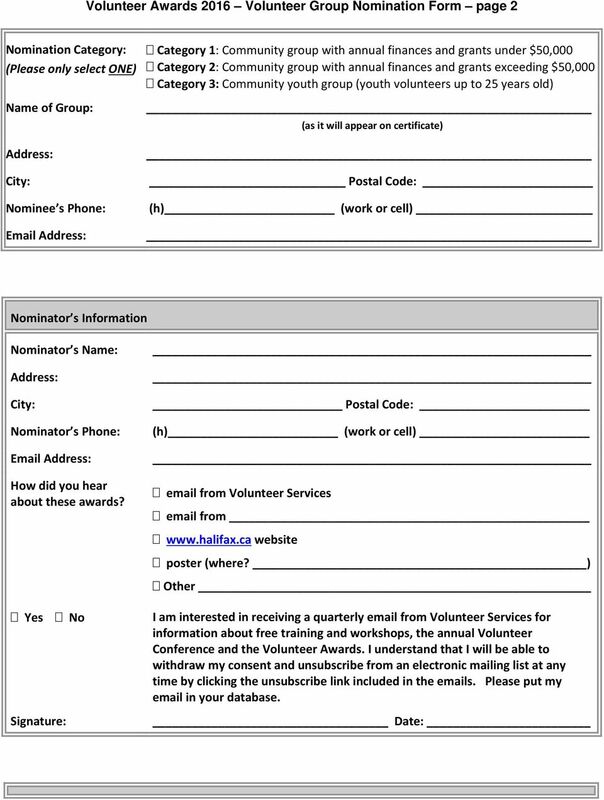 If you have any questions about the collection and use of this information, please contact the municipal Access and Privacy Office at or Please submit your nomination by or on Friday, December 11, MAIL: Volunteer Awards 2016 c/o Municipal Volunteer Services P.O. Box 1749 Halifax, NS B3J 3A5 DROP OFF: Attention: Marilyn Smith Findlay Community Centre 26 Elliot Street, Dartmouth FAX: For more info: Marilyn Smith, On behalf of Halifax Regional Municipality we would like to thank you in advance for taking the time to nominate a deserving volunteer from your community. September 17, 2015. If you have any questions, please contact me at 919-807-7195 or email me at hickmanm@nccommunitycolleges.edu. Applications must be received by: March 11, 2011 Incomplete or late applications will not be considered. ... And we want you as Honorary Jr. Mayor! This Scholarship is not currently open. You cannot use this application form. It appears on our website for information only. Oklahoma Governor s Arts Awards 2016 Nomination Form Sponsored by the Oklahoma Arts Council Governor s Arts Awards Since 1975, the Oklahoma Arts Council has sponsored the annual Governor s Arts Awards. Each year, the GSA puts out a call for Quality Money proposals in order to solicit proposals from interested parties across the university. 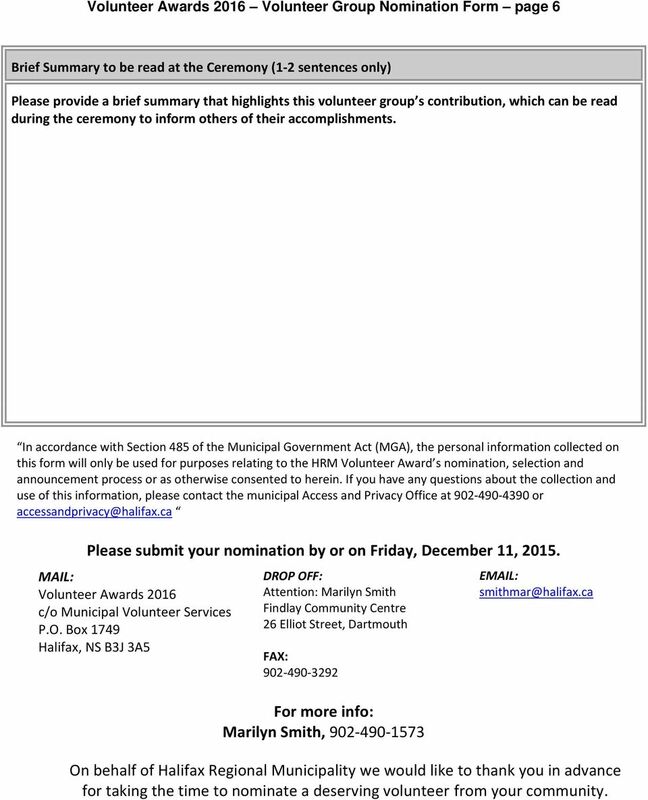 Jurors are not eligible for nomination and may not submit nominations or support letters. Nomination Form Organization Award This is an award for a school or education organization that has developed models, strategies, and programs that have made an impact in the field of Indigenous Education. YOUTH LEADERSHIP TRAINING Spaces limited! Application Deadline is May 15, 2015. Your organization will then receive the benefits of a quarterly check for your SHARE of the qualified purchases. It s that easy! REQUEST FOR QUOTATION RFQ number/date RFQ Collective Number Q15M029 Contact person/telephone Mitchell Crowell/902 490-4207 This number must appear on all invoices lading bills, containers and correspondence. Thank you for your interest in applying for the First City Development Corporation E Community loan program.